Omar Thornton seemed fine when he left his ex-girlfriend's house Tuesday morning, his ex-girlfriend's mom said. But then Kristi Hannah, the ex, received a call from police. They were looking for Thornton. Kristi's mom Joanne relayed the story: Kristi frantically called Thornton’s friends, his mom, anyone, trying to find information. Then Thorton’s mom returned the call and delivered a chilling message. “He called (his mother) this morning and told his mother he shot five people and was basically saying, ‘I love everybody. Tell everybody I love them and goodbye,’” Joanne said. On that call, Thornton's mother spent 10 minutes trying to convince him not to kill himself, Holliday, Thornton’s uncle said. Joanne had seen Thornton on Monday and said he seemed fine. He spent the evening with Kristi, who he had dated for eight years, as he sometimes did, and gave no indication when he left for work that anything was wrong, Joanne Hannah said. Then, according to police, the 34-year-old driver went on a shooting rampage, killing eight Hartford Distributor co-workers and then himself. Thornton, 34, lived with Kristi in Enfield until about two months ago, when she moved to South Windsor and he moved in with his mother. Family members describe Thornton as a hard worker who held two jobs and cared for his family, including a daughter. They also describe him as someone who loved to tell jokes and laugh and are stunned and confused by what happened at Hartford Distributors early Tuesday morning. “If I stand here and tell you how good he is, then I’ll look like a liar. Let’s just wait and see how the story comes out,” Holliday said. Those who knew him well, say Thornton was not a man who would kill 8 co-workers in an unexpected workplace shooting. “Omar didn’t have a police record. He had a permit to buy guns and all these things. He was a good person,” said Holliday. One of Thornton's coworkers said he started working for Hartford Distributors a couple years ago as a packer and worked his way up to be a truck driver. Police offered no theories on Thornton's motive, but sources told NBC Connecticut that he had a disciplinary hearing at the company on Tuesday. 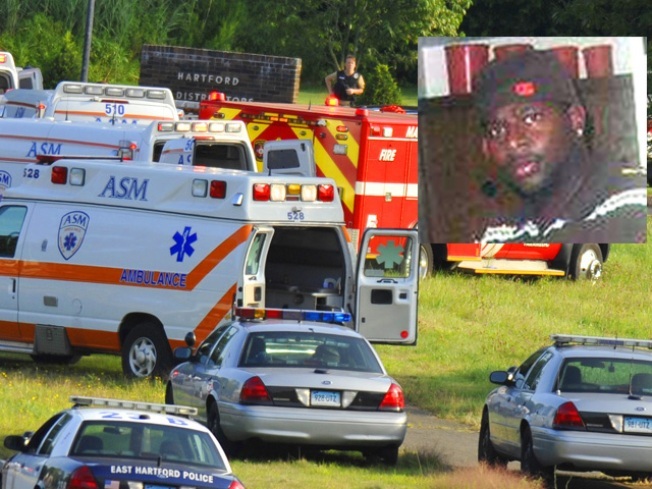 Thornton had been caught on videotape stealing beer from Hartford Distributors and was supposed to meet with company officials when the shootings began, Teamsters official Christopher Roos said. Union members say they think Thornton hid the guns in his lunchbox. They describe him as cool, calm and "cold as ice," in the meetings. Joanne Hanna said he complained to Kristi about being racially harassed at work. He said he had cell phone photos of racial slurs written on the bathroom walls. Thornton complained to his superiors, who said they would talk to Thornton’s coworkers, and that was as far as it went, Joanne said. “I’m trying not to cry. It’s shocking. I didn’t know he had a problem here,” said Kathy George, a co-worker. James Battaglio, a spokesman for the families who own the distributorship, said he had no immediate information about the allegations of racial harassment. A union official said Thornton had not filed a complaint of racism to the union or any government agency. Thornton was a driver for Hartford Distributors, union officials said. Department of Motor Vehicle records show that his CDL license was suspended for a little over a year after he received two speeding tickets. He received a ticket in February 2007 and and another in December 2007, His license was suspended from Dec. 17, 2008 until Feb. 15, 2009. Thornton’s family members are offering their condolences to the families of the victims. “There’s no winner here. You have 9 families that are grieving tonight and nobody wins. It doesn’t matter what the situation is, nobody wins,” said Holliday.